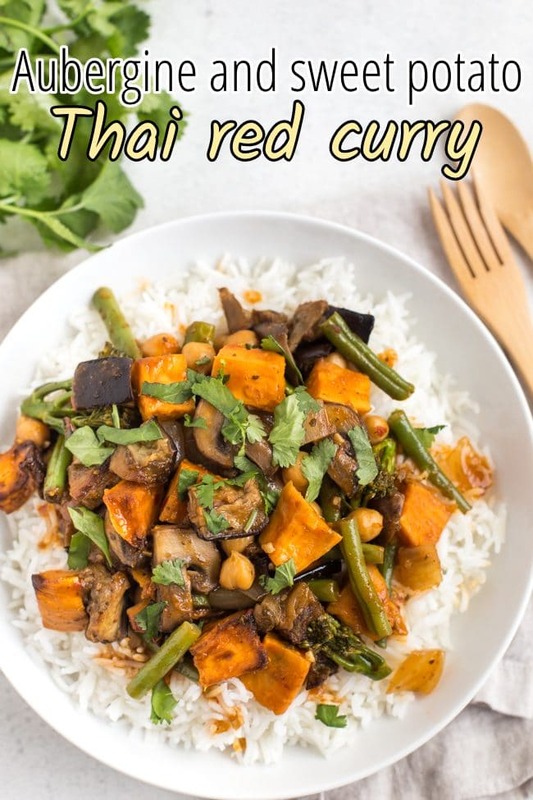 A sweet and spicy Thai red curry that couldn't be easier to make! Switch up the veg if needed to use whatever you have on hand. An easy Thai red curry with roasted sweet potato, melt-in-your-mouth roasted aubergine, and lots more tasty veg. No weird ingredients or long shopping list here! I adore Thai red curry. It’s spicy, but not in a ‘blow your head off’ kind of way, just in a ‘ooh my tongue is tingling and I like it’ kind of way. It’s the perfect balance of sweet and spicy – a really tasty curry which can be made with just a few simple ingredients. 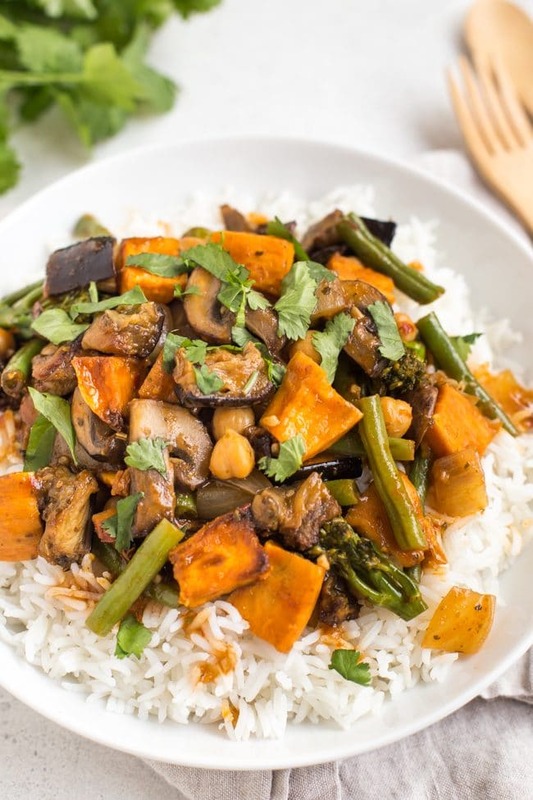 This aubergine and sweet potato Thai red curry is chock-full of veggies – plenty of different tastes and textures to make for a really tasty dinner! You can make a Thai red curry sauce with just two ingredients – Thai red curry paste, and coconut milk. Just cook whatever veggies and protein you like, add the curry paste, then simmer in the coconut milk. In the past I’ve added extra ingredients to my Thai red curries – lemongrass, kaffir lime leaves, even a spoonful of sugar – but to be honest it always felt like I was adding things just for the sake of it, and the end result was no better. Turns out, I really do just prefer things simple – and since someone has already gone to all the effort of creating a curry paste that tastes amazing, who am I to argue? So two ingredients it is. It’s hard to make a bad Thai red curry, especially when you’re using a shop-bought curry paste. 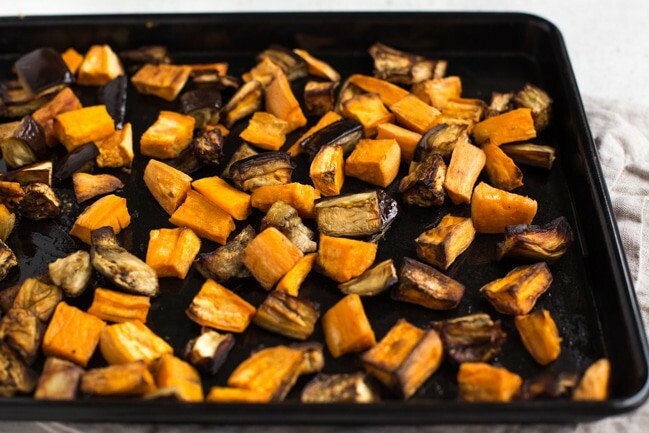 But a really easy way to really take your curry up a notch is to roast the vegetables first. Roasted veggies are the best. 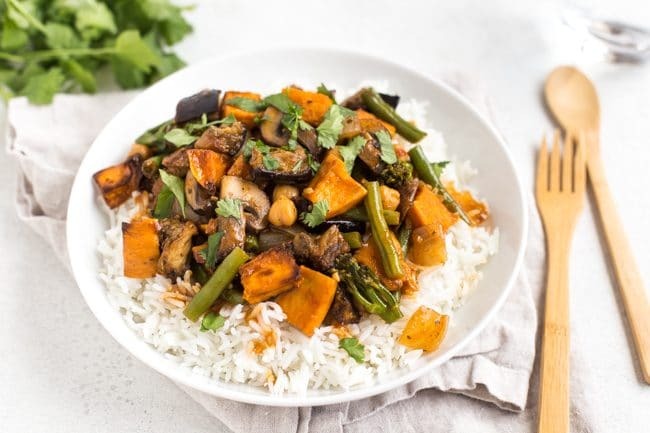 I didn’t roast all of the vegetables for this Thai red curry – only the aubergine and sweet potato, which are the veggies that improve most with roasting. Sweet potato can be a bit ‘meh’ when you just boil it, but when it’s roasted, its sweetness is intensified, and it gets nice and crispy around the edges. And aubergine (eggplant) becomes truly melt-in-your-mouth when it’s roasted. Then just pop them in a big pan or wok with the other veggies, add the Thai red curry paste and coconut milk, and you’ve got yourself a curry! Is Thai red curry paste vegetarian? The longer answer: A lot of curry pastes are made with fish sauce, or other non-veggie ingredients – but there are lots of vegetarian versions out there too. I find that the cheaper supermarket own brands are usually vegetarian (I guess it’s cheaper for them to make it veggie! ), whereas the more expensive brands often aren’t. Just make sure you check the ingredients before you buy! 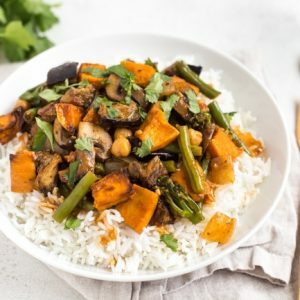 How should I serve Thai red curry? I often serve Indian-style curries without rice (I’m more of a naan bread girl), but when it comes to Thai curries, I think fluffy white rice is a must! The curry sauce is quite thin, and it’s just beautiful when it soaks right into the rice. Add a good handful of chopped coriander (cilantro) on top, and it’s good to go. Peel the sweet potato, and cut into chunks. Also dice the aubergine (eggplant). Toss the two vegetables in a dash of oil, and spread them out on a baking tray. Roast at 190°C (Gas Mark 5 / 375°F) for around 40 minutes, or until soft in the middle and crispy round the edges. Meanwhile, heat a dash more oil in a large frying pan or wok. Add the onion and mushrooms, and cook over a medium heat for a few minutes, until slightly soft. Add the garlic and green beans, and cook for a few more minutes. Add the Thai red curry paste, and mix to coat. 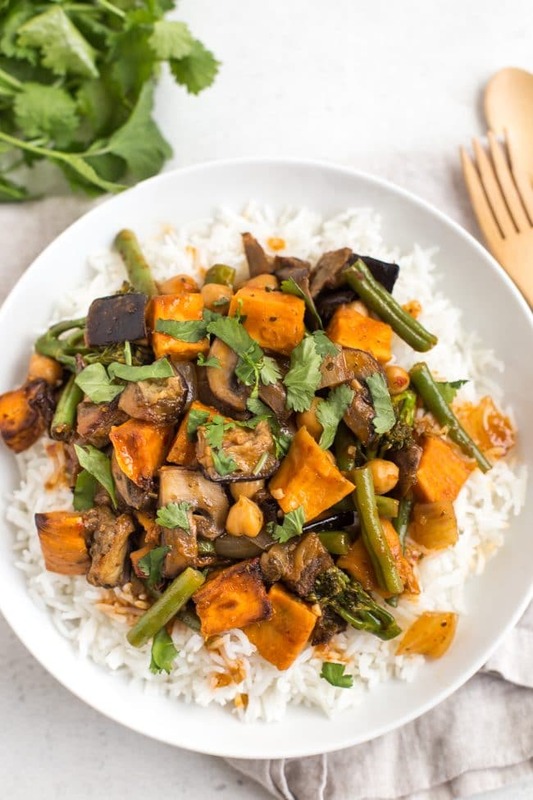 Pour in the coconut milk and vegetable stock, and add the Tenderstem broccoli and chickpeas, along with the roasted sweet potato and aubergine. Bring to a gentle simmer, and cook for another 5-10 minutes, until the vegetables are cooked to your liking. Serve the Thai red curry with white rice, topped with fresh coriander (cilantro) if desired. Note: Nutritional information is approximate, and will depend on exactly what ingredients you choose. Information above is for 1/3 of the recipe, not including rice. Got some Thai curry paste that needs using up? Add a dollop to these tasty filo spirals!